After three consecutive sell out years The Parklife Weekender 2013 looks set to continue the trend despite increasing in size. The Parklife Weekender is now one of the major festivals in the UK this summer. Weekend tickets for 8th - 9th June are running low and organisers expect them to sell out before the end of April. This year sees the first ever Parklife Express, ensuring ticket holders travel safely too and from the Heaton Park venue. 2013's Parklife Weekender is set to be the biggest and best yet, featuring globally renowned artists including Plan B, Example, Rita Ora, Jessie Ware and the return of hip-hop legends Jurassic 5. Again this year The Parklife Weekender continues to work closely with local DJs and promoters including the likes of Mono_Cult, Dollop, Tuesday Club and Abandon Silence. With weekend tickets priced at only £69.50 The Parklife Weekender is arguably the best value for money festival in the UK this year. With less than nine weeks until The Parklife Weekender, organisers urge those without weekend tickets to purchase them now as they are set to sell out before the end of April. With hundreds of live artists and DJs performing at this years event, it's not surprising that tickets are running low. Having moved location to Heaton Park this year The Parklife Weekender has grown in size and in aspiration, bringing ticket holders the very best in global and local talent. 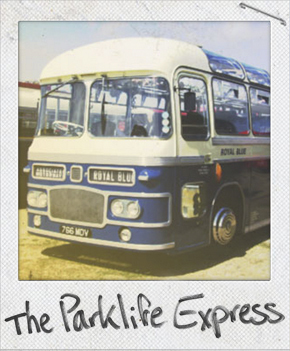 New this year is the Parklife Express, enabling Parklife Weekender ticket holders to travel safely, easily and very cheaply from both the City Centre and student district Fallowfield. There will be dedicated bus services running from Fallowfield and the City Centre directly to Parklife's own bus station at Heaton Park. These services will operate from bus stops opposite Owens Park in Fallowfield and from a location in the City Centre, to be confirmed. The return journey will be direct to the City Centre to take ticket holders to the after parties. These services will be operating continuously from 10.30am on Saturday and 11:30am on Sunday. Single day tickets are £4.50, for a return journey from Owens Park to Parklife bus station to City Centre, weekend tickets are £9.00. Aware that many people will be travelling to and from The Parklife Weekender at Heaton Park, the Manchester Metrolink is also doubling their weekend services to ensure an easy journey to and from the festival. Parklife Express tickets can be brought in person from Squirrels Bar (Owens Park Campus) in Fallowfield, and go on sale 15th April at 11am. Bus tickets will also be available to purchase online, please note these will be subject to a credit card handeling fee. The best way to travel to and from Heaton Park is by Metrolink. The closest stop is Bowker Vale on the Bury line. There are now six Metrolink lines servicing the whole fo Greater Manchester for more information go to www.metrolink.co.uk. There will be 'double trams' operating to give plenty of capacity. There will be a clearly signposted route straight to and from the event site.